It was my oldest son Nicholas’ birthday on the 21st of August. I like to have the kids come for dinner at their convenience and try to cook them what ever they ask for. 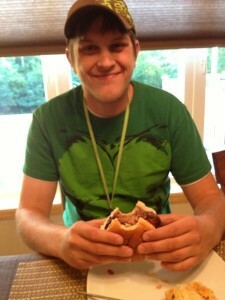 Nick requested the Juicy Lucy, or Jucy Lucy, depending on who is serving it, as well as cheesy hash browns. He’s not a big fan of food “outside of the box” and likes to keep things simple. These were an easy enough request, so I served them along with a simple side salad and homemade ranch dressing. 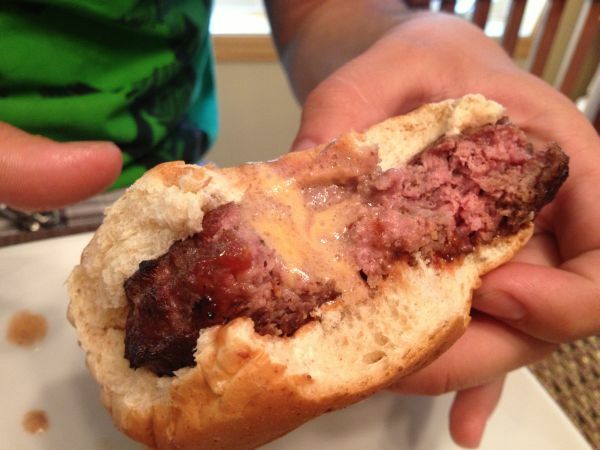 The Jucy Lucy/Juicy Lucy is a cheeseburger that has the cheese inside the meat patty rather than on top. 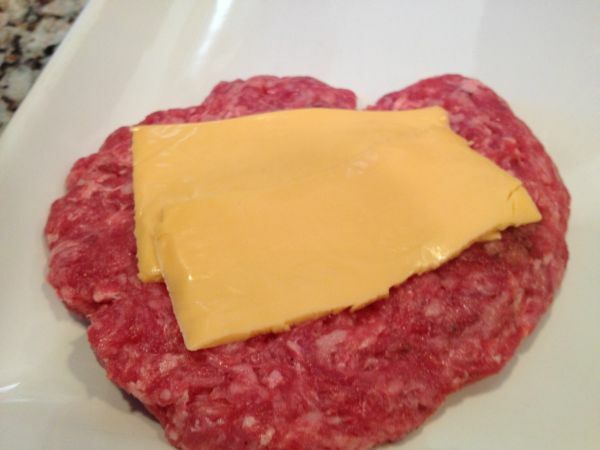 Cheese is surrounded by raw meat and cooked until it melts, resulting in a molten core of cheese within the patty. 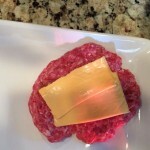 If you use American cheese, it tends to gush out at the first bite, so servers frequently warn patrons to let the burger cool for a few minutes before consumption. Two bars on the same street in South Minneapolis both claim to have invented the sandwich but you can find it on all kinds of menu’s in numerous restaurants these days. Even the Food Network Magazine now has a recipe on-line. I’ve made them before and I keep it simple. These are delicious! And Juicy! 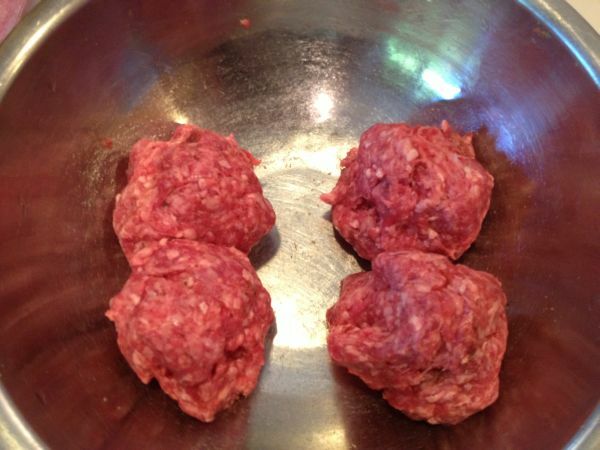 Combine the ground beef with the salt & pepper, and seasoning salt in a bowl. 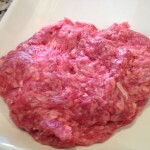 Mix together well, but don’t over knead the meat. 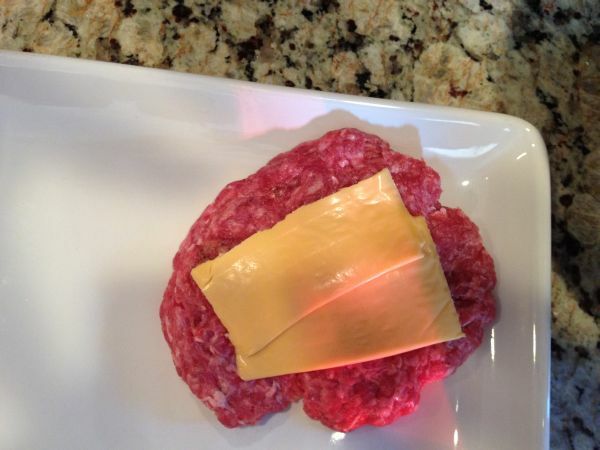 To make two large burgers, divide the meat into four equal portions and place on a work surface. 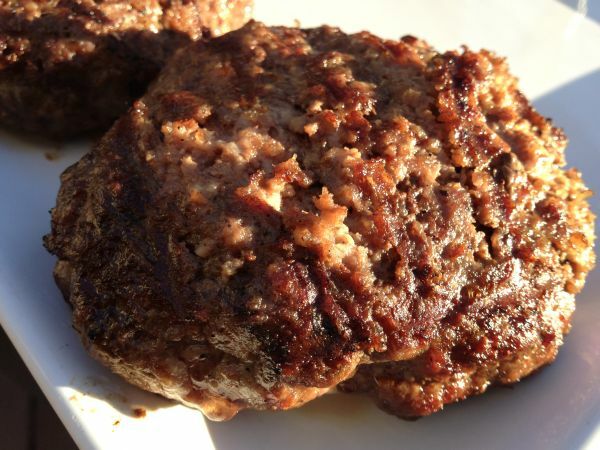 Using your hands, press the portions of the meat into 1/4 inch-thick patties that are each about an inch wider in diameter than the hamburger buns. 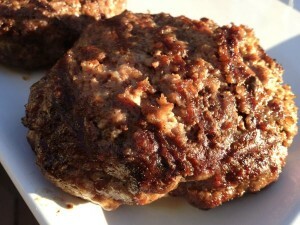 Top with the second patty and pinch the edges to form a tight seal, cupping each patty with your hands to round out the edges. 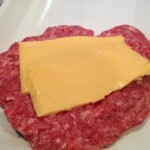 Press on the top to flatten slightly into a single thick patty. Grill over medium high heat, about four minutes. Grill marks should appear on the bottom. 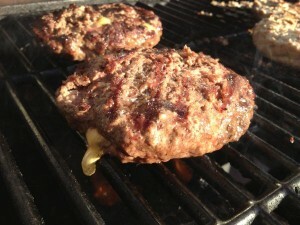 Using a spatula, flip the patties and cook an additional four minutes or so until grill marks appear on the second side. Do not press down on the patties. 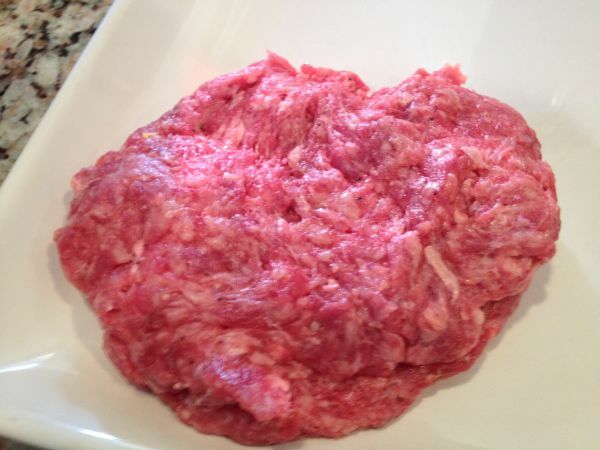 Cook less for medium and longer for well done burgers. Remove from grill and place onto a clean plate; allowing burgers to rest for about five minutes. Place a patty on each bun bottom, top with pickles, tomatoes, lettuce, onions; mayonnaise, ketchup, mustard or whatever else you prefer and cover with a bun top. Serve immediately. 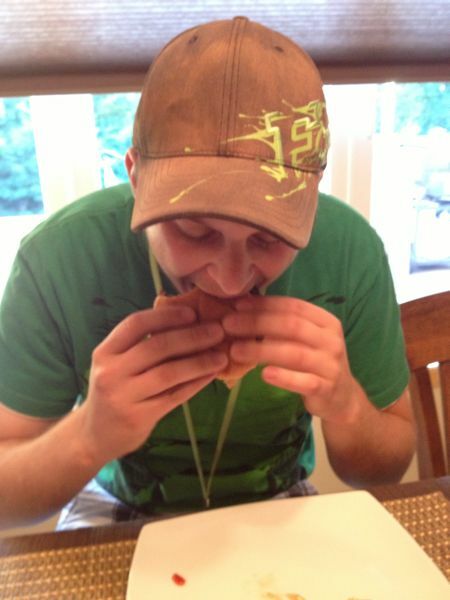 Nick had to lean over as it was oozing and dripping with the delicious “juicy” he was hoping for! Happy Birthday Bud! 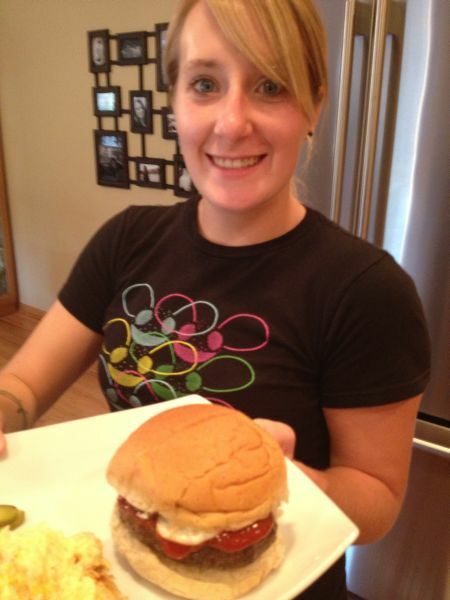 Nicks’ beautiful fiance Bri enjoyed hers as well! The rest of us enjoyed turkey burgers at Bills request for a “healthier option”. They too were moist and flavorful, because I mixed the ground turkey with the same seasonings and added a half a container of skim milk ricotta cheese. They really turned out delicious and we ate ours with the cheeses on top!